One of the worst things that can happen to a website owner is to receive a notice of legal action as a result of breaking the law. If your website doesn’t comply with laws designed to protect consumer rights, you’re breaking the law. Being non-compliant not only puts you at risk of incurring significant financial losses, but also the cost to your reputation. Why risk your money and your good reputation, when you can protect yourself so easily and inexpensively? In this article, we review a simple and inexpensive WordPress solution that can help make your site compliant in minutes. 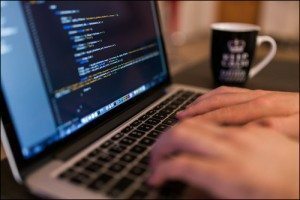 As the cybersphere continues growing at an extraordinary rate and the rules of the game constantly change, it’s important to stay informed about what’s happening and to make sure that your website remains compliant, especially if your digital presence is a fundamental aspect of your overall business strategy. If your online business is not in compliance, you could face a multitude of penalties, including fines, having your website shut down, even jail time! At the very least, without making it clear to your visitors that your site complies with legal requirements and regulations, expect visitor trust and confidence in your business to seriously diminish. Legal Disclaimer: We are not lawyers and we are not offering legal advice on our website. 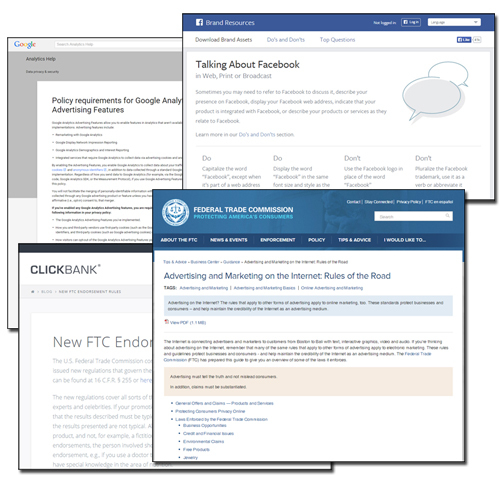 There are solutions that can help your site become more compliant, such as the tool that we discuss below. If your website or blog is lacking in terms of compliance, there is a simple plugin for WordPress users that you should know more about. 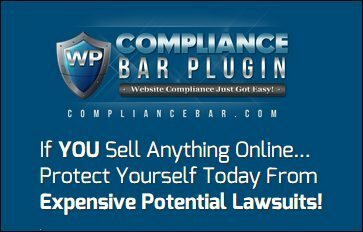 Compliance Bar installs like any WordPress plugin. Just upload the plugin file to your Plugins folder via your administrator login and activate. Easily edit the default templates inside the plugin from the settings menu using the WordPress visual content editor. 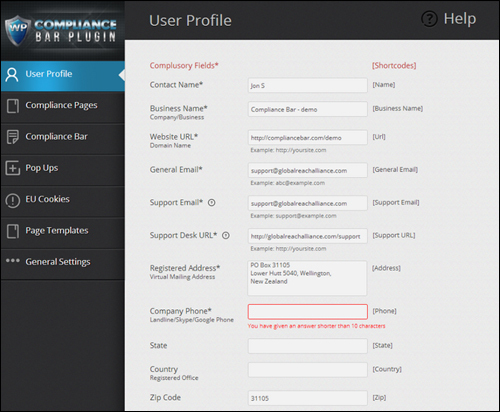 Compliance Bar plugin provides a dedicated team to help users. 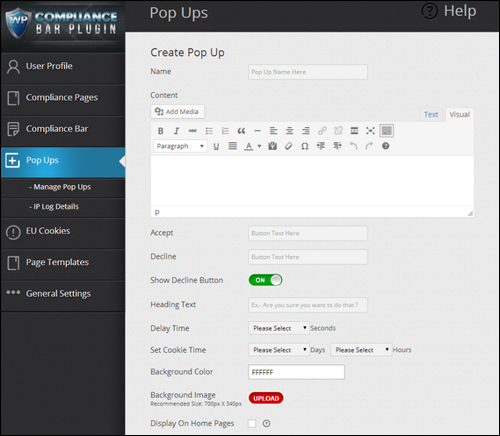 Customized Templates: The Compliance Bar plugin creates your legal pages in seconds and customizes them to your business and website. Video Training Manuals: Compliance Bar is not complicated to use – a complete library of training videos is provided. 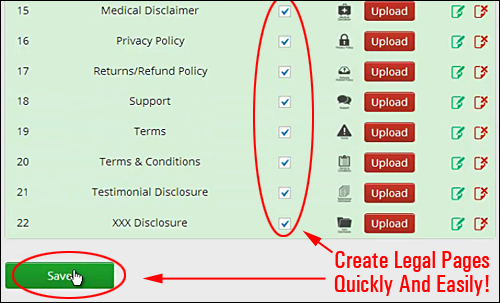 Can Be Used Anywhere In The World: As long as you consult someone who is qualified to give you legal advice to ascertain if the built-in legal page templates provided with the plugin are suitable and satisfactory for your business, country and website, you can use the plugin wherever you are located. 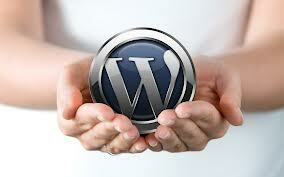 Use For All Website Purposes: As long as your website or blog is powered by WordPress, you can use the plugin for every website purpose. Select only the types of disclaimers which pertain to your particular business model (e.g. affiliate or CPA marketing, business services, AdSense, AdWords, adult, medical, etc) and leave out those that you don’t need. Fast and easy to install and set up. Ready to use in no time. 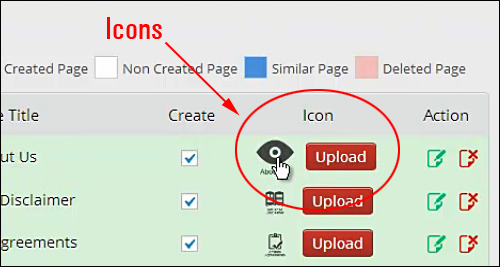 Display Attractive Icons – Display links to your legal pages using attractive icons that can be positioned anywhere in your page. You can also upload your own icons. Display Restricted Information – If your site includes content that should be restricted to certain age groups (e.g. information related to alcohol, ecigs, adult-related, etc. ), the plugin can display pop-ups that require users to accept your website’s terms or disclaimers. 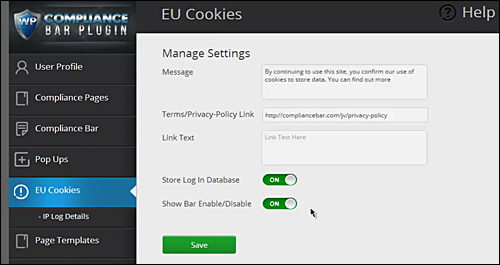 EU Cookie Compliance – If you are based in Europe or display your content to EU visitors, you need to make users aware of your user cookies and notify them of how you use them. The plugin displays an attractive bar that notifies users and protects your website from non-compliance issues. Records & Stores IP Acceptance – Compliance Bar records and stores the IP address of your visitors for reference, just in case someone accepts your terms or disclaimers and then claims they didn’t. 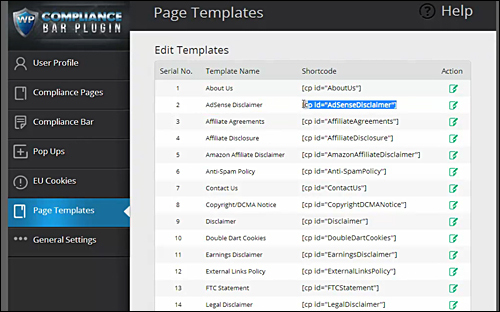 Shortcode Driven – Compliance Bar uses shortcodes to populate templates with your personal information. These shortcodes also allow you to place information anywhere on your site, (even in the pop-ups). Mobile Friendly – Compliance Bar has settings for displaying on mobile devices and tablets and can display mobile optimized icons automatically depending on visitor mobile browsers. After installing and activating the plugin, a section where the plugin’s settings can be configured is added to your WordPress backend. Once the minimum required (i.e. compulsory) information has been input into the plugin settings fields, you can then access the other plugin section. 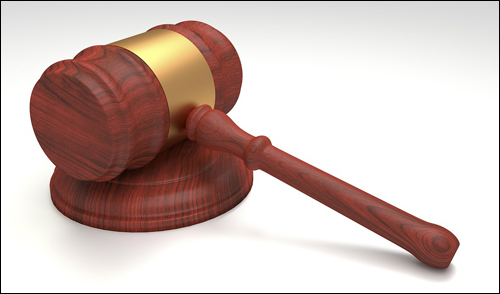 Your legal pages will then be created and added to your “Pages” section. 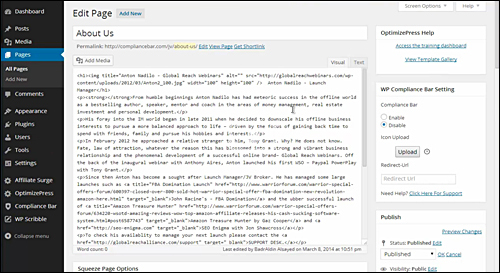 The plugin notifies you if it detects existing similar pages on your site (e.g. pages created before you installed the plugin). 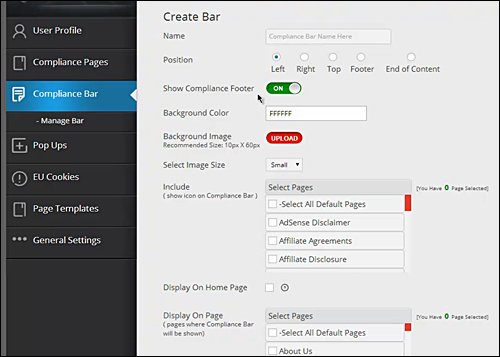 You can create a number of Compliance Bars to display different icons on different pages, or to cover different uses in other sections of your website. The plugin lets you display a Compliance Bar on the front page of your site, even if you are using a specific theme framework (like Genesis, Thesis or WooThemes), where the home page is specifically configured through the theme itself as a built-in template, and not as a normal “static” page. If you plan to show content that should be restricted to certain age groups (e.g. information related to alcohol, tobacco, dating, etc. ), the plugin can display popups that require users to accept your site’s terms and disclaimers. Display compliance icons on specific pages of your site only. Minimize refund disputes by clearly spelling out refund terms before customers purchase. If your site published adult content, you can force visitors to click to confirm that they are of legal age to view your content. 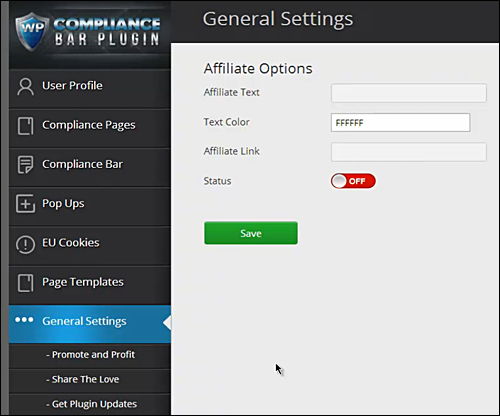 Compliance Bar provides users with dedicated plugin support to assist users with anything they need. You also get access to complete video training manuals. Additionally, your purchase is backed by a no-risk, 30 day, 200% refund guarantee. 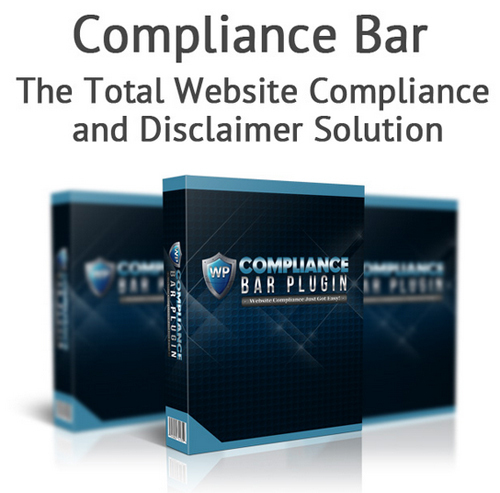 If your edition of Compliance Bar does not work within 30 days of purchase and it cannot be fixed within 48 business hours (M – F), the plugin developers will refund double your purchase price. Business Licensing – Can be installed on up to twenty-five sites that you own. Cost = $67.00 (Normally $197). Professional – Install the plugin on multiple of your own domains. Install the plugin on all client sites for payment or part of a paid service. Cost = $97.00. Note: The price of the product can vary, depending on whether there are any promotions or limited-time special offers. Currently, the software is being retailed for the amounts shown above. This may or may not be the actual pricing charged by the product developer when you visit the website and you may be shown additional upsells or one-time offers after your purchase. Legal Pages Approved By Lawyers – The plugin developers assert on their website that all legal templates have been reviewed and approved by a leading lawyer. Nonetheless, we highly recommend that you get legal advice from a qualified legal expert in your area to ensure that your site is fully compliant. 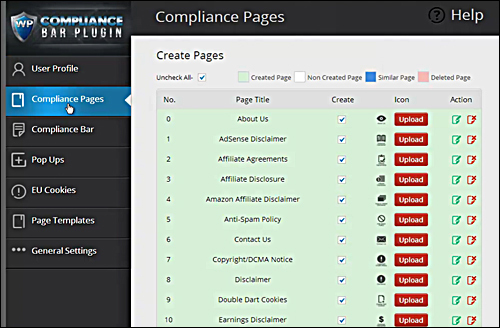 For a demo video showing plugin usage, including help documentation and tutorials, FAQs, support helpdesk, contact details and more, visit the Compliance Bar Plugin website. 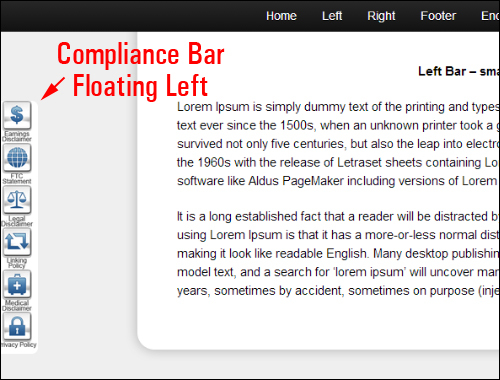 Compliance Bar is an easy-to-use, simple and cost-effective solution for WordPress-powered sites. We recommend installing this plugin for WordPress users if you want immediate peace of mind and legal protection. Disclaimer: Once again, we are not lawyers and we are not offering legal advice on our website. You must do your own due diligence and consult a legal expert about the best way to ensure that your website fully complies with all legal requirements wherever your business is based.